Doctor’s visit # 291,997 today… I gained another 3 pounds. In 2 weeks. And you know what? I just don’t care anymore. Sure, I probably should not have had that peanut butter cup concrete last night, but dammit, I deserve it! Lugging this baby around is hard work! I also had the disturbing experience of seeing sparkly spots twice yesterday. My doctor didn’t seem too worried about it, since they weren’t accompanied by headache, facial swelling or abdominal pain, so I guess I won’t worry either. I was so bad today, though! I left poor Coco outside to fend for herself the entire afternoon! And who is Coco, you ask? 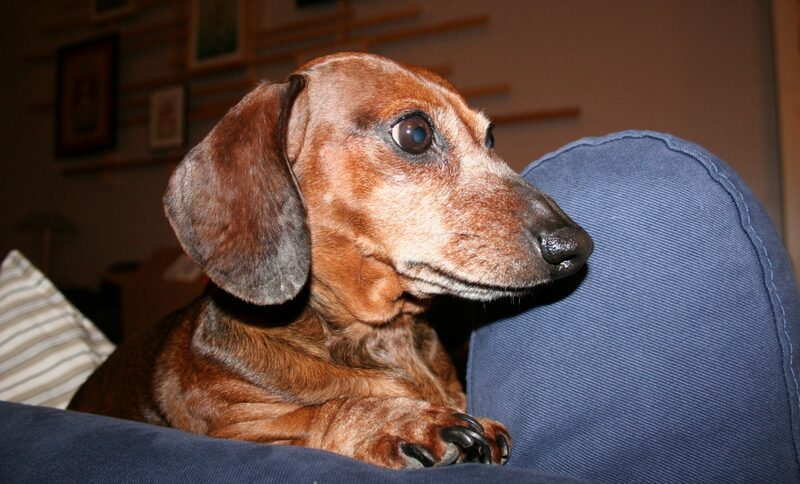 Coco is the oldest of our four “miniature” dachshunds. I say “miniature” because they are all over the required mini weight of 11 pounds, but less than the standard weight. As such, they are considered “tweeners.” Cute, huh? Anyway, I got home from the doctor’s visit and Coco was nowhere to be found! Of course, I immediately had, like, 8 heart attacks and went tearing around the house calling, ‘Coco!’ She came bounding up to me, her whole body wagging, and lept into my arms. I then cried tears of joy and fed her many treats for not running away. What kind of mom am I going to be, for God’s sake?